It’s almost as if it happened last week – that’s how vivid the memory is. I was seven or eight and wanted to be an astronomer. One night shortly after my grandfather died, I went outside alone to look at the stars. Back then the stars over rural Florida were grand to behold, especially on a crisp, fall, moonless night. It happened on such a night. I noticed a star overhead getting brighter and bigger and closer. I grew frightened and ran back inside. I listened by the screen door. Then, nothing, not even a bang. I don’t think it was a UFO, never did, not even at the time – probably a meteor. In any case, the memory remains distinct and somehow glorious. UFO artist Ionel Talpazan (1955-2015) had a similar experience as a child – but with a significant difference. Rather than a fiery ball of light, he saw “a ‘blue energy’ radiating from a mysterious source.” This sighting “became the source of his art,” William Grimes says in his New York Times article celebrating Talpazan’s life and work (several examples of his paintings are included). For another thing, he went outside not to grieve alone but to escape a beating. Talpazan grew up in a Romanian commune and escaped Nicolae Ceaușescu’s brutally repressive regime by swimming across the Danube in 1987. He was granted political asylum in the United States and spent the rest of his life living in New York City, first on the streets then moving to an apartment in Harlem. In The Telegraph obituary I learned that Talpazan began drawing UFO images four years after his encounter and over time amassed more than 1000 artworks. The Telegraph obituary adds several interesting details not mentioned in Grimes’ piece, and both tell you more about his works and how he came to be recognized by the art world. Contrary to what my whimsical photos suggest, Talpazan was more interested in extraterrestrial technology and space travel than in extraterrestrial beings, especially in how “flying saucers” could “bring about a better world by introducing a benevolent technology” (folklorist Daniel Wozcik, quoted by Grimes). In fact, Talpazan once told the journal Western Folklore that his art “shows spiritual technology, something beautiful and beyond human imagination, that comes from another galaxy … Something superior in intelligence and technology. So, in [a] relative way, this is like the God. It is perfect” (quoted by Grimes). The notion of a “spiritual technology” is what really grabbed my attention. Do we currently have any technology that we might describe as “spiritual,” something that is remotely “like the God” here on earth? The computer comes to mind with its amazing capability to crunch numbers, find information, render 3-D virtual worlds, and so much more. (Oddly, Talpazan was a low-tech guy who didn’t own a computer, not even a telephone.) For me, however, the technologies of aviation and recorded music have produced more transcendent moments than any other technologies in my experience. What about for you? 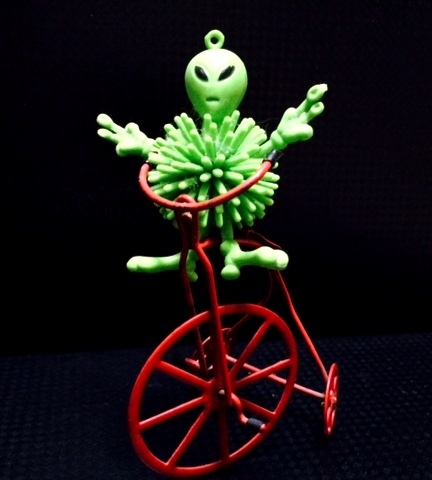 Young Alien Showing Off on a Trike: the alien is a key chain ornament, and the trike is part of a Christmas ornament. 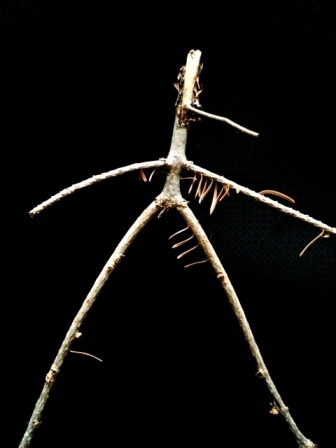 Alien Stickman: something I found on the golf course. The black background in both is my Razer laptop box. Update to previous post on Steve Jobs: Here’s the recent NPR review of Danny Boyle’s just-released movie Steve Jobs. I haven’t seen it yet but found it interesting that the movie stops chronicling Jobs’ life before he oversees the creation of the iPod. I agree with the reviewer that a sequel must be planned because the movie ends about halfway through Walter Isaacson’s biography, on which Aaron Sorkin’s screenplay is based.